As we approach the new academic year here at Chabad at Penn, we take a moment to reflect on the year that has passed. It is with the partnership of Alumni, Parents and supporters like you that we are able to reach hundreds and hundreds of Jewish students on Penn’s campus every year. We take this opportunity to share some brief highlights of our activities with you so that you can see for yourself, how your support is tangibly impacting the Jewish future. On behalf of the staff and students at Lubavitch House at Penn, we send you our warmest wishes for a sweet New Year. A plethora of learning opportunities is available at Chabad, a few of the programs we provide are mentioned below. The Sinai Scholars Society is a dynamic and interactive learning program which engages students with little background in formal Judaic study. 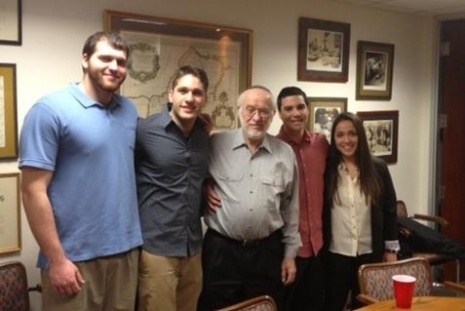 Sinai Scholars helps students discover the richness of their heritage at points of personal interest, connects them at academic symposiums, and fosters their growth as they grow into Jewish adults. As part of the program, Lubavitch House took the Scholars on a day trip to New York featuring visits to observe a scribe as he penned mezuzahs, tefillin and a Torah Scroll, a Mikvah tour, the Historic Chabad Library, and a visit to the International Shluchim Center as well as the renowned 770 world headquarters. Spending the day visiting a community immersed completely in Jewish life proved to be an eye opener for the students and was an immensely memorable day, from the study hall filled with hundreds of students engrossed in Torah learning to the liquor store filled with all kosher spirits and learning about the process of producing Kosher wines. Other Jewish learning programs and classes bring text-based learning to life with in-depth studies and personal connections in one-on-one or small group settings. Texts studied include Talmud, Tanya, Jewish law, Jewish history and the Fascinating Facts course. 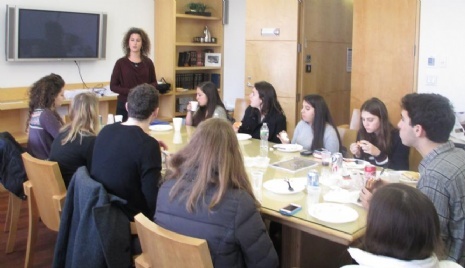 Lunch and Learns in Graduate Schools provided a continuing education series on varied topics; from Jewish views on medical ethics, to the Haggadah and practical Passover preparation. “My Jewish education came to a halt after I stopped going to Hebrew school. During the years without Jewish education, I lost my faith. I no longer believed in G‑d and saw many negatives in religion. Sinai Scholars actually whipped me back into shape… The topics we discussed hit all aspects of life and imbued a greater sense of meaning to them. What stood out to me most was the ability to relate everything back to one thing: G‑d. Today’s leaders at Penn, are tomorrow’s leaders at large. As history has proven time and again, new ideas executed at Penn have a global impact; this is also true in the Jewish sphere. The reason for this is that the students we work with at Penn today will be leaders in all kinds of fields tomorrow. Our aim is to infuse the choices of these leaders with Jewish values; making the world a better place. Our work with the Chabad Student Leadership group is twofold. Through mentoring and learning sessions we teach our students how to create and develop a vision as well as the skills required to lead. Our leaders meet with highly successful professionals, from all sectors, as well as faculty members at Penn, who share their experience and expertise with the students. The students are then given the opportunity to implement those skills by creating programs for other students on campus. Our leaders are talented and motivated young men and women, who are driven to share our message with as many people on campus as possible. They feel passionate about Jewish life on campus and strive to find innovative and fresh ways to reach out to Jews at Penn. The Rebbe taught us that “everyone must be a leader”, it is our privilege and responsibility to impact the people around us for the better. From the inspiring and uplifting High Holidays, we moved straight on to an exciting Sukkot holiday. The holiday, which is so easily pushed to the wayside after Rosh Hashanah and Yom Kippur, became unmistakable this year. 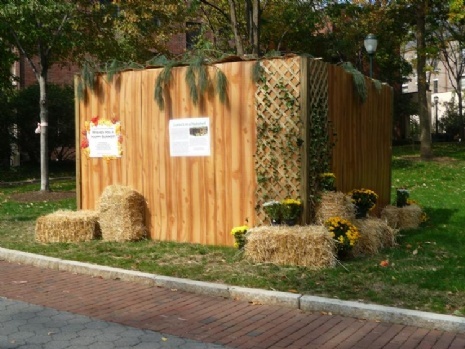 Our inviting Sukkah on College Green attracted hundreds of students and faculty members; to shake the Lulav and Etrog or sample our rotating menu of snacks, such as sushi, matzah ball soup, Mexican salsa and falafel. A surprise visit from Prof. Nechama Sataty and her Hebrew Studies class was a real treat for all as she taught her class in the Sukkah. Additionally, traditional Holiday dinners were celebrated every night of the seven days in our Sukkah at the Chabad House. Purim and Chanukah were celebrated in style, with performances by the Penn band and mass distributions in dorms and on campus of menorahs and holiday treats. Public menorah lightings and Purim parties ensured that these holidays were not at all forgotten. Passover saw a jam-packed Chabad House serving multiple seder options simultaneously, from the Seder Lite version to the traditional option, plus overflow, all were educational, warm and enjoyable. Many students stayed late into the night singing holiday songs and searching for the Afikoman. Matzahs were distributed in the dorms and on Locust Walk by the pound to very appreciative students. Lubavitch House at Penn attracts prominent speakers and scholars on a wide array of Jewish topics. 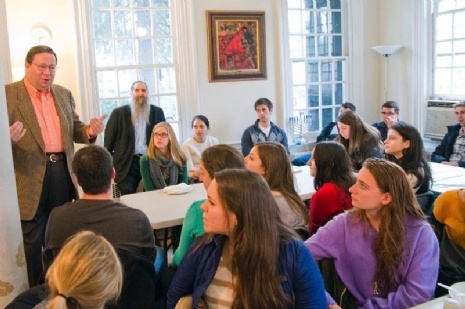 This past year, students took advantage of Lubavitch House as a hub for these engaging speakers. 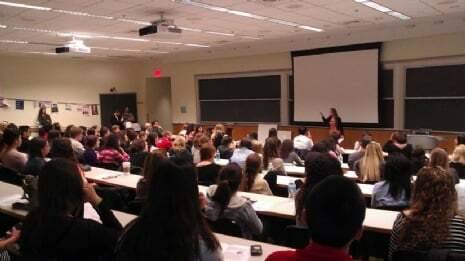 Jessica Klein (Screenwriter, 90210, Sesame Street) spoke about introducing Judaism to Hollywood. In an engaging and exciting talk entitled, "Write Jewish, Cast Goyish: Jewish Writers and Identity in Hollywood" Jessica Klein reflected on her own experience in Hollywood, from creative, personal, and spiritual perspectives. Asaf Romirowsky a Middle East research and adjunct scholar at the Foundation for Defense for Democracies and the Middle East Forum gave an introduction to Middle East politics and its impact on Israel today. Rabbi Meir Levinger (Director of Women’s Program, Mayanot Institute of Jewish Studies) gave a text based class on the topic of "V’Ahavta: and you shall love… The art of cultivating and generating emotional love for G‑d and humans through intellect". In conjunction with Penn’s ‘year of proof’, Rabbi Tzvi Freeman (Director of Ask the Rabbi, Chabad.org, noted author, musician and speaker) addressed the topic of ‘Is it foolish to believe anything without proof?’ Rabbi Freeman looked into some classic Jewish treatments of the symbiosis of faith and reason over Shabbat dinner followed by a Musical Melave Malka on Saturday night with his classical guitar. Rabbi Sneiderman Director of Chabad at the University of Delaware and teacher at Gratz Hebrew High, Wilmington JCC's Melton Program, and in the Philosophy Dept. at UD gave an introduction to Jewish philosophical approaches to understanding G‑d. Simcha Weinstein (Rabbi, Author of Up, Up, and Oy Vey! And comedian) provided an evening of inspiration and many laugh out loud moments as he lectured on “Love in the Time of Darwinism” and other topics relevant to a young Jewish college student in today’s society. 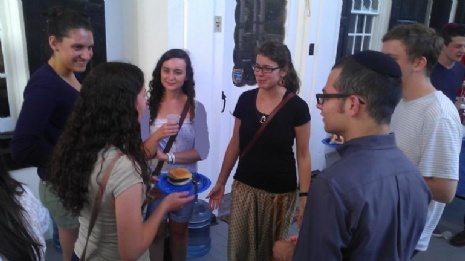 “Looking back at my Penn experience, I am so glad that I was able to find a community in Chabad. It was great to feel so welcomed somewhere and to learn about Judaism with my friends. I enjoyed being able to take excursions to NY to visit Jewish professionals and Crown Heights. I also appreciated having a place to go when I was on campus for major holidays or for Shabbat once in a while. Lubavitch House’s Healthy Living Task Force and its affiliated student group CogWell run by Rabbi Ephraim Levin brought actress Brittany Snow and her “Love is Louder” campaign to campus. 250 students attended a talk by actress Brittany Snow, where she discussed erasing the stigma against speaking out about eating disorders, mental illness, and bullying. Students found Snow’s talk to be very honest and relevant, and were excited to meet the actress in person. 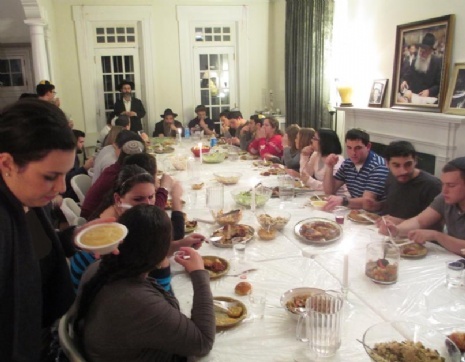 Jewish Heritage Program’s Shabbat for 2K—was a far-reaching success. 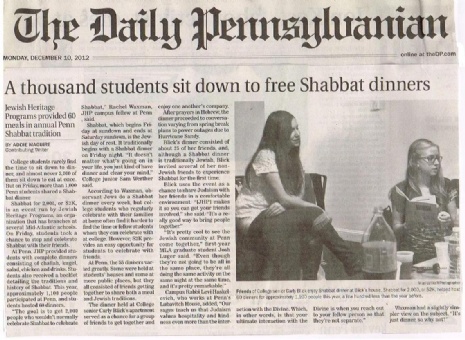 Hundreds of students hosted simultaneous Shabbat dinners for their friends across campus, introducing many students to the idea of leading Shabbat dinners, as well as tens of students who had never before attended such an event. 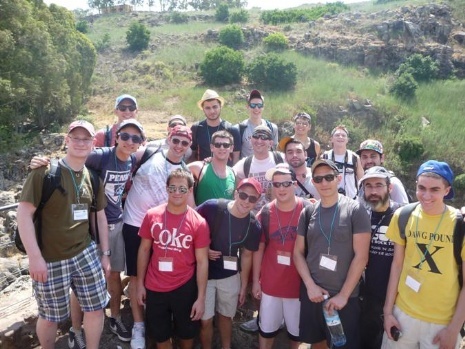 Lubavitch House organized and led a trip for 40 students to Israel this past summer. The birthright trip is the first organized trip to Israel that these students experience, which establishes a personal connection to our Holy Land and the Jewish People. Students gain insight into what a Jewish Homeland means, as well as an understanding for Israel as a part of Judaism. Contributions listed are from July 31st 2012—August 31st 2013. We apologize for any inadvertent omissions. Lubavitch House is a 501 C 3 organization and all donations are tax deductible.